Tealyra pearl tea quenches thirst and creates harmony in your soul. Jasmine green tea is a great drink which is loved all over the world. A tonic tea is recommended as a natural antioxidant and uplifting morning drink. The best green tea brand is great for those who are on a diet and want to lose weight. A real gift from nature! Chinese green tea with jasmine has numerous benefits: it improves mood, stimulates brain activity, promotes nervous system activity and vision sharpness, and helps to fight insomnia. Tea from green tea leaves is a natural tonic which can be drunk every day. You can drink green jasmine tea in cold seasons to warm up, and when it’s hot try cool china tea with ice (refreshes and lifts you up). The tasty jasmine flavor doesn’t need additional ingredients. The tea in both cold and hot varieties is very tasty. Just 3.5 minutes and you have a great tonic drink for the whole family. You can brew loose tea leaves right in the cup for 1 portion or in a teapot if you make the drink for a few family members. Green tea with antioxidants, unlike black tea, can be brewed several times (put the leaves in a kettle and pour water on them up to 3 times). For the correct brewing of loose tea you need water of the right temperature. Do not use boiled water. Green pearl only needs water with a temperature of 80-85 С. If you follow this rule, the tea leaves will give all of their benefits and the drink will be extremely tasty and aromatic. If you drink pearl dragon every day, you’ll feel lightness in your whole body, and great physical and spiritual feeling. High-quality and always fresh Tealyra teas are a great taste for you, your family and guests. ALWAYS FRESH TEA OF THE HIGHEST QUALITY. When buying Tealyra loose leaf tea, you can be sure that you'll get a high-quality product. We offer Chinese tea for real tea lovers, and those who know what good tea is. GREAT TASTE AND AROMA. Just brew and try some tea made with the Jasmine green tea leaves once and you'll understand why this type of organic green tea is so popular all over the world. The taste of green tea with its sweet flavor, provided by jasmine leaves, refreshes, and lifts you up. A fine, tender aroma makes this drink a sophisticated delicacy. TEA YOU'LL APPRECIATE. Caffeinated Jasmine tea warms you up in winter and picks you up in the summertime. It is a natural antidepressant and can improve your mood, stimulate brain activity and is a great cure for the common cold. 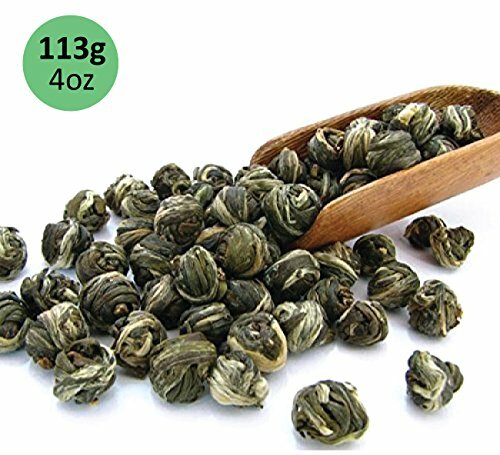 The huge number of benefits makes jasmine pearl tea a real gift from nature for everyone, without exceptions or negative side effects. THE MAIN THING IS TO BREW IT PROPERLY. The process of brewing dragon pearl tea is unique with some special features. Boiled water can't be poured over green tea leaves. You have to use water with a temperature of 80-85?. After pouring water over the tea, wait for 2.5 - 3.5 minutes and then enjoy this unbelievable drink. LOOKING FOR A GREAT GIFT IDEA? Organic tea makes a great gift option for friends, relatives, colleagues and neighbors. A high-quality, beneficial and tasty Chinese green tea is a great idea for any holiday.